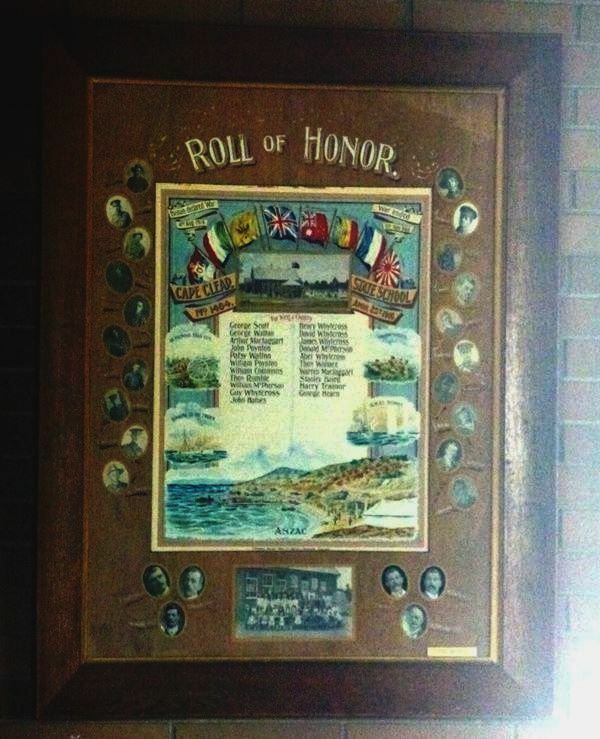 A framed paper honour roll with photographs commemorates former pupils of the school who served in World War One. The roll was originally unveiled in 1916. The Anzac Day Celebration on Thursday afternoon at the Cape Clear State School was a memorable one. Interest in the celebration was also intensified by the fact that opportunity was taken of the occasion to unveil a splendily conceived and designed honor roll, the handiwork of Messrs Campbell, Wilson Prop., engravers, of Ballarat. The roll of honour was admired by all who had the opportunity to see it. With an elaborate heading, amply indicating the purport of the artistic production, down each side were photos of the soldiers who had already borne the brunt of battle in Europe, and who also had as boys attended the local State school. The roll contained the following names: —George Scott, George Walton, Arthur Mactaggart, John Poynton, Patsy Walton, William Poynton, William Commons, Thos. Rumble, Henry Whyteross, David Whyteross, James Whyteross, Donald M'Pherson, Abel Whyteross, Thomas Wallace, Warren Mactaggart, and Stanley Baird, the latter being one of those on the Sydney when she challenged and accounted for the sinking of the Emden. There is room for additional names, and it is anticipated that ere long all available space will be occupied. Excerpt from Pitfield Banner and Hollybush Times (Vic) 29 April 1916.